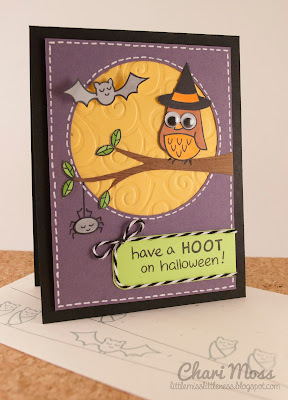 In the past week I have made Three owl cards! This is not because I am an owl fanatic or anything, but it just seemed to work out that way. First I was inspired by the Lawn Fawn DT to create something halloween-y. I was going have the sentiment say "Have a Hooty Halloween" but my husband was not on board with that idea so I changed it. Then a coworker requested a wedding card for a wedding she had to attend. 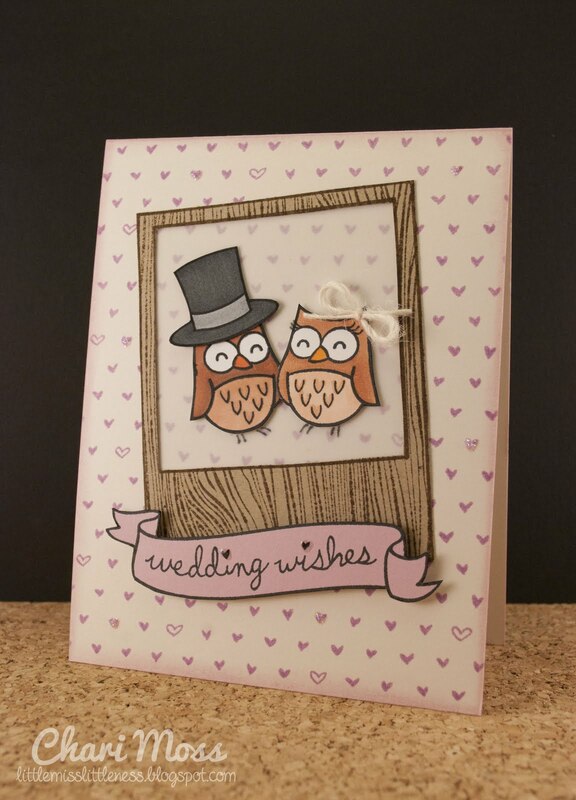 I turned to the little owl again, because I thought he would be good to try and mirror to make a wedding couple. Can you guess how many Lawn Fawn sets I used on this card? I was pretty shocked I used so many when I counted them up. Just goes to show how amazingly well they all work together. Then on Saturday I had a friend ask me if I could make a custom card for her to give her husband for their anniversary. She said he liked owls so naturally I had to use owls once again. Thanks for stopping by today! I wish you all a happy week! Holy owls! And you know what? They're all freaking adorable! On the first card, I LOVE that hat and how it makes the owl very halloweenlike. On the second card, I'm in love with that woodgrain frame. It's perfect. (And I love the reverse stamping!) And that dragonfly on the third card is the perfect touch. Uh oh... I think I need to go play with my owl stamp now. Thanks for sharing, Chari! Wow these are so amazing! 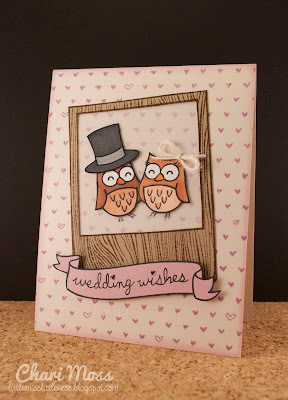 Love the various ways you've used the owls, so inspiring! Ahhhh so cute! That little owl is super versatile! Each card has its own perfect touch that made it special. I love the dragonfly's path with the heart, beautiful! WOO HOO! 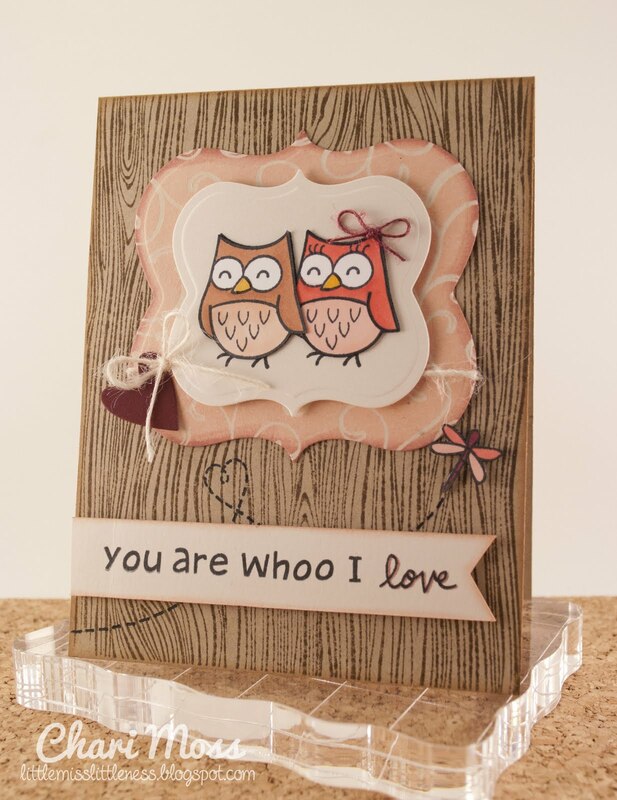 Loving these hootalicious owls! Amazing cards!!!!!! These are all just adorable!!! I love ALL of these!!! You know, I ordered the LF Hats on Monday - I had already placed a LF order on Thursday for a few other sets & decided that I really needed them! (speaking of which, will any happy mail come to me today... I'm waiting ever so patiently!!!!). Anyway, it's so funny because I was walking my dog Sunday night and just couldn't stop thinking about a witchy owl - thats so funny that you made one!!! It came out so cute!!! I also love the other 2 cards & your friends must have flipped for them!! All three are genius! Love how you used them in different ways. Way too cute, now I need to get me some owl stamps! These are just so darn cute! I am sure your friends LOVED them! Really adorable! These are all so CUTE!!!! I LOVE the embossed moon in the first one, the hat and bow you added to the owls in the second one, and the heart you created in the dragonfly's trail in the third one!! AWESOME details!!! I just came across your bio on Lawn Fawn site and I love your cards! My daughter lives in Asheville NC as well. She teaches at Warren Wilson College in Asheville. We a few times a year. It is beautiful down there!